At a distance of only 200,000 light years, the Small Magellanic Cloud (SMC) is one of the Milky Way's closest galactic neighbors. With its millions of stars, the SMC offers astronomers a chance to study phenomena across the stellar life cycle. In various regions of the SMC, massive stars and supernovas are creating expanding envelopes of dust and gas. 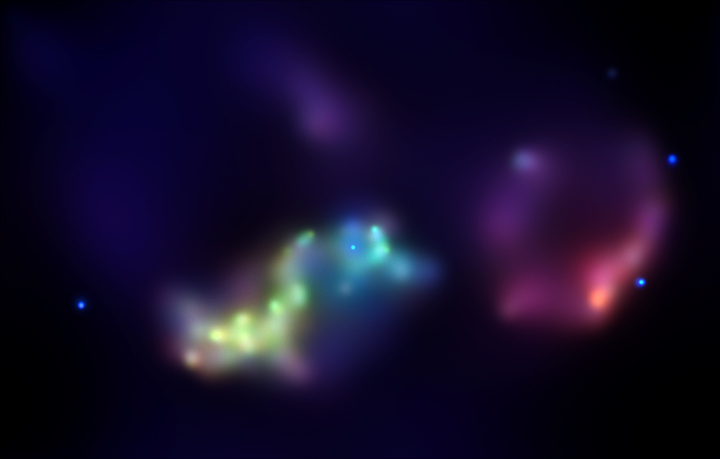 Evidence for these structures is found in optical (red) and radio (green) data in this composite image. Astronomers used Chandra to peer into one particular region of clouds of gas and plasma where stars are forming. This area, known as LHa115-N19 or N19 for short, is filled with ionized hydrogen gas and it is where many massive stars are expelling dust and gas through stellar winds. 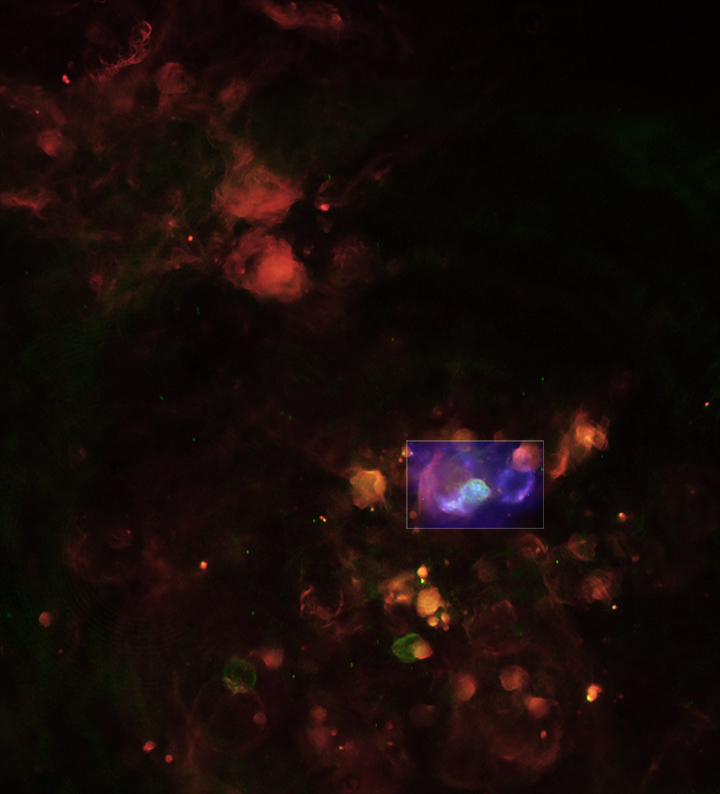 When the X-ray data (blue and purple) are combined with the other wavelengths, researchers find evidence for the formation of a so-called superbubble. Superbubbles are formed when smaller structures from individual stars and supernovas combine into one giant cavity. The Chandra data show evidence for three supernova explosions in this relatively small region. Furthermore, the Chandra observations suggest that each of these supernova remnants were caused by a similar process: the collapse of a very massive star. There are hints that these stars were members of a so-called OB association, a group of stars that formed from the same interstellar cloud. Credit NASA/CXC/UIUC/R.Williams et al. ; Optical: NOAO/CTIO/MCELS coll. ; Radio: ATCA/UIUC/R.Williams et al. Coordinates (J2000) RA 00h 47m 17.00s | Dec -73º 08' 22.00"